FC Kilmarnock Ladies is the oldest women’s football club in Scotland, founded in 1961 (as Stewarton Thistle). Since those halcyon days, the running of a ladies football club has changed dramatically, with a huge emphasis on the cost of maintaining a position to challenge for honours, and pushing to restore the days of SWPL football to Kilmarnock. To that end, we are looking for forward thinking individuals and businesses looking to help the club develop by sponsoring a first team player for the 2017 season, at a cost of £250. 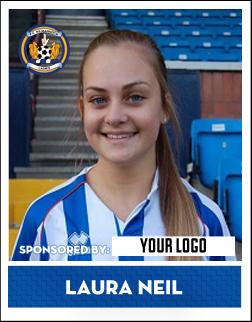 Your name and/or company logo on FC Kilmarnock Ladies website and your logo as sponsor on the player's profile 'sticker' (see right). Your name and/or company logo in the players profile section of the official FC Kilmarnock Matchday programme when the agreed player is featured.